NIce LO. Love old photos because they tell a story and remember with photos is like living again. Beautiful result for the time you sweet daughters invested. Your mom is sure to love the end result! This is such a gorgeous layout! GORGEOUS layout! What a soft and pretty color combo!!! Love how you used all the elements on this layout! The stamped images go so well with the photos! I just found the comment you left last week on my blog. Eek, sorry I was not more prompt. I will try and shoot you an email after this holiday weekend, if it is not too late. 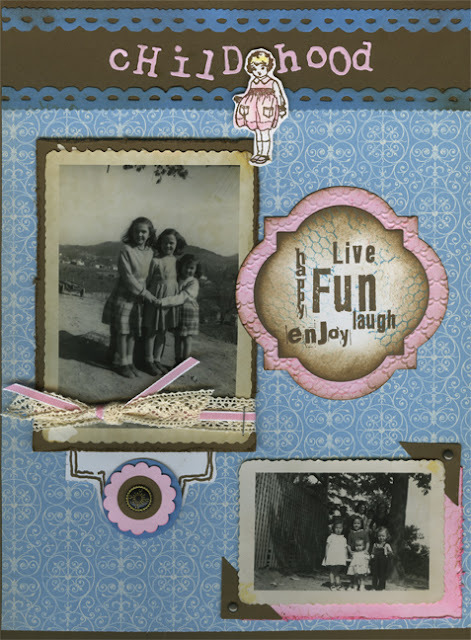 Your scrap page is wonderful! Your layout is wonderful! I'm a slow scrapbooker, too. It took me all afternoon to do a page today. Wonderful layout! Love the photos! This is completely fabulous! LOVE! The photos are great too!